HydroRush was On-The-Air with Heavy T and the Fellas, talking about how HydroRush works and provides many benefits for your plants and growing systems. We’ve edited parts of Heavy T’s Grow Show so you can get right to the questions. To listen to Our unedited segment of the show, there’s a link toward the bottom of this page or you can listen to the complete show here. HydroRush is an alternate Oxygen source that works great with your Beneficials, is pH neutral, Non Hazardous and Non Toxic. How would you use HydroRush? Added to your nutrient solution: For any garden to be able to uptake nutrients, the conversion process must first be utilized by bacteria. HydroRush keeps the anaerobic and anaerobic bacteria in balance by providing Oxygen at a molecular level to enable your garden to be able to utilize your nutrients efficiently. Use in Compost Teas, “True” Organic Nutrients and Mineral Nutrients for positive response. The common perception is that there aren't bacteria in Deep Water Culture reservoirs. Does HydroRush help? The reality is that there are bacteria in every system and HydroRush will therefore help that system. What dilution or dosage is recommended? In Hydro Systems we currently using 3-4 ml. per gallon, in Soil we use 6-8 ml. per gallon. Does HydroRush replace any of my Nutrients? No, HydroRush doesn’t replace any of your Nutrients. We promote a balanced microbial environment, giving your microbes (bacteria) the ability to do their job efficiently. Is HydroRush beneficial to brewing Compost Teas? Yes, we’ve experienced extending life of Compost Teas for up to 2 weeks by keeping the bacteria alive. How much does HydroRush cost? Our suggested retail price is $ 29.99 for Quarts and $89.99 for Gallons. For the small dosage that is recommended, this is a very good value for the cost per gallon and the benefits that it provides. In many cases Organic Nutrients that have a short life cycle are not immediately available. Increased microbial activity has the ability to help increase the efficiency of nutrient uptake toward making them more available. Does HydroRush reduce built up residue on containers and reservoirs? Yes, One of the things that gardeners have reported to us was that their systems were quite a bit cleaner because HydroRush keeps your bacteria stimulated and doing it’s job, it will digest the waste that’s in your system and as a result will convert and release those nutrients instead. What’s shelf life of HydroRush? HydroRush is very stable and will last at least 2 years. Will HydroRush cause any fallout or problems with existing nutrients? Is it adding Oxygen or pulling Oxygen from what’s already there? How is HydroRush different from H2O2 (hydrogen peroxide)? HydroRush is very different from H2O2. Hydrogen Peroxide is a sterilizing agent HydroRush is not. H2O2 is a poor unstable source of Oxygen. Why do you recommend using HydroRush only up to the first week of bloom? 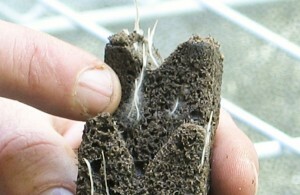 Sometimes you do not want Nitrogen uptake at excessive levels in your plants during this phase of your growing cycle. In some situations Nitrogen residue is still present and HydroRush that is activating the bacteria can actually help your plant extract and utilize the Nitrogen that is still in your system that you’re not aware still exists and sometimes this is undesirable. How exactly does it raise the Oxygen levels? The method of respiration in bacteria is called Anoxic Respiration. So, HydroRush provides Oxygen as an oxidizing source not as a pure Oxygen source. Is HydroRush safe to use in an Easy Cloner and Ebb and Flo? Yes, As we talk about on the Website, start at a low rate because your nutrient solution is in constant contact with the vegetative and rooting sites. 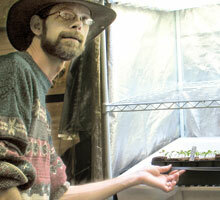 In our Pepper Plant Side-By-Side Growing Tests, we used 1-2 ml. per gallon on our seedlings with noteably visible results as you can see if you follow this link. So, stay low and go slow. In Flo and Grow systems HydroRush works great. You can increase your dosage to the 3-5 mls per gallon and add it to your reservoir and you’ll be in good shape. Use our Store Locator on our Contact Page or send us an eMail. You can always contact Sunlight Supply too. Find Hydrorush and the “Fellas” at any one of these stores. And, another one coming soon. Courtesy of the “Big Guy” himself Heavy T. Pay him a visit today.